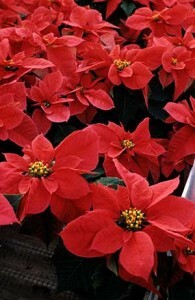 With the right production schedule poinsettias can be grown in almost any size container, even as small as 2.5 in. pots. Needless to say, low vigor cultivars work best. 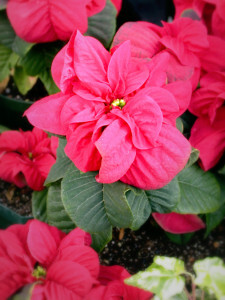 Irrigation can be difficult for miniature poinsettias as they dry out quickly and olants may need to be irrigated several times a day. Ebb-and-flow irrigation works the best. Capillary mats work well, but can encourage stretch. If using capillary mats, allow plants to dry occasionally to reduce stretch. If using sub irrigation be sure to leach frequently as EC can increase rapidly in the small substrate volumes. Apply approximately 200 ppm N, but not with every irrigation. The following schedule (courtesy of Paul Ecke Poinsettia) can be used.